The blog represents the first results of a four year investigation of the “skull measuring business” in Ireland in the 1890s. That project was funded by the Irish Research Council and Shanahan Research Group in association with Maynooth University and the School of Medicine, Trinity College Dublin. The presentation develops ideas that were first presented to the Irish Conference on Folklore and Ethnology in Belfast in November 2018. This presentation deals with ethnicity, nationalism and folklore, drawing on a forgotten anti-Imperial movement in British folklore. It begins with an anti-colonial speech delivered by Alfred Haddon in Ipswich in 1895. Haddon was aligned with the volkskunde wing of the folklore movement in Ireland and opened his speech by acknowledging nationalist efforts to disengage from political and economic union with Britain. Haddon entered anthropology through folklore, equating the destruction of native customs in subjugated territories with the loss of personal identity, ethnicity, and, ultimately, nationhood. Haddon spoke to Patrick Geddes and Havelock Ellis about reconstituting anthropology as a vehicle for radical anti-colonial activism. They were inspired by the anarchist geography of Kropotkin, the radical ethnology of Reclus, and the “Zeitgeist” of Gomme (FLS). This conference looks like the place to remember an engagement between Irish nationalists, English folklorists and stateless anarchists /ethnologists on the brink of Ireland’s exit from union with Britain. The Dublin Anthropometric Laboratory operating in the field in the Aran Islands in 1892. Courtesy of the Board of Trinity College Dublin. The original schedule of measurements taken from Tom Connelly. The schedule was based on a form developed by francis Galton for his anthropometric laboratory in London. Courtesy of the Board of Trinity College Dublin. The photograph above shows Alfred Cort Haddon [on the right], with Charles R.Browne [on the left] measuring Tom Connelly (Ó Conghaile). It was taken in 1892 during an ethnographic survey of the Aran Islands. The survey was undertaken by the Dublin Anthropometric Laboratory, which was established in Trinity College Dublin in 1891. Francis Galton designed the laboratory and its main operating procedures. The Royal Irish Academy provided operational funding. Daniel J. Cunningham, Professor of Anatomy in TCD, provided the premises. Haddon was responsible for a programme of fieldwork that was undertaken in what he described as “ethnical Islands” in remote parts of the West of Ireland. This image of Haddon measuring the skulls of Irish peasants encapsulates much of what has been written about his fieldwork in Ireland. The literature is – generally speaking – preoccupied with race bracketed by evolution and colonisation. It represents Haddon’s framing of “the Irish” as the antithesis of the cultural construction of nationality that was promoted by Douglas Hyde, the folklorist who set the agenda for cultural nationalism and republican separatism in the 1890s. This presentation sets out to disturb this consensus with some awkward, little facts that have been gleaned from Haddon’s papers – mainly his journals of fieldwork in Ireland, his correspondence with Patrick Geddes and Havelock Ellis, and some key anti-imperialist statements written by him between 1891 and 1892. These “facts” were used to test the relationship between, information, rhetoric and historiography in the context of organised science and the politics of ethnology, anthropology, and folklore in the 1890s. The question here, is whether these “facts” can sustain an argument that Haddon incorporated anarchist ideas into the agenda of folklore collection in Ireland in the 1890s, an argument that complicates conventional treatments of the historical relationship between ethnicity, folklore, and nationality in the context of Ireland’s exit from the UK. Clara Patterson, 1893, Children Playing “Poor Mary” in Ballymiscaw. The presentation concludes with a look at Haddon’s collaboration with Clara Patterson, a zoologists turned folklore collector and photographer. This is used to demonstrate that Haddon the Head-hunter was, in fact, a politically radical and formally innovative folklorist. In this presentation I’ll be looking at the role that folklore played in the political and cultural arguments that were generated by home rule; the campaign to take Ireland out of political and economic union with Great Britain, which dominated Anglo-Irish relations in the the 1880s and 1890s. There are some obvious parallels with Brexit. The Customs Union and a backstop for the Protestant minority in Ireland featured in the first Government of Ireland [home rule] Bill of 1886. That bill was defeated by the Conservatives supported by Unionists. The difference are far more significant. Ireland was a colony and the intertwined campaigns for home rule and land reform were confronted with “coercion” legislation and the mobilisation of imperial forces. Cultural forces were also mobilised in a debate about the compatibility of the Celt and the Anglo-Saxon in relation to nationality and governance. Folklore collectors provided evidence of a pre-conquest nation that had survived in the edgelands of Empire in Ireland. Folklore, in this context, is generally treated as a resource for cultural nationalism. I am not arguing with that. What I am proposing, however, is that there was a far more radical, anti-Imperial movement in Anglo-Irish folklore and that it was led by Haddon, the head-hunter. Haddon entered organised anthropology through the Folklore Society. In 1890, Gomme congratulated the Society on its capture of Haddon, who abandoned natural science and became an ardent folklorist. Gomme added that Haddon was pursuing his folk-lore work in Ireland and that he was expecting great things from him. Haddon visited the Aran Islands for the first time and 1890. He wrote in his journal that they were the most remarkable islands he had ever visited. He spent a week documenting the islanders and their way of life. Haddon, it seems, had discovered a village community that had managed to escape the worst consequences of the Anglo-Saxon – his words – colonisation of Ireland. Pyotr (Peter) Kropotkin, the Russian anarchist in exile in England, had used the idea of a village community to reject social-Darwinist arguments advanced by Thomas Henry Huxley in 1885. Huxley, it should be noted, was probably the most powerful public scientist in Britain at the time and was, in many ways, Haddon’s boss. Havelock Ellis commissioned Gomme to write a book on village communities. Gomme acknowledged that the social organisation of some village communities resembled modern socialism. That claim has to be taken with some caution. It could be that the political commentary was insinuated by Ellis as editor of the volume. Nevertheless, Haddon read Gomme’s book before visiting the islands and he informed Ellis that he had noted the influence of the zeitgeist. In 1892, Haddon returned to the islands to conduct an “ethnographic” study of the inhabitants. The influence of both Kropotkin and Gomme is evident in the report that was published in 1893. First, the introduction makes an historic distinction between race and ethnicity. Second, the emphasis on the relation between race, place and political economy is consistent with Kropotkin’s work on the village communities, which Ellis had adopted as a key part of his political agenda. In January, Haddon persuaded members of the Belfast Naturalists’ Field Club (BNFC) to undertake fieldwork on behalf of the Ethnographic Survey of the UK. He presented the survey of the Aran Islands as a model. The members agreed to collect folklore, but declined to undertake the measurement of peasant skulls . In November , Douglas Hyde, the folklorist, gave a lecture at the BNFC on Celtic language and literature. Hyde was followed by Haddon in January 1895. Haddon lectured on ‘Modern Relics of Olden Time’ and introduced a link between children’s games and savage dances. As a result of these contrasting presentations, Hyde and Haddon have been linked in debates about the relationship between folklore, ethnology, and cultural nationalism / home rule. In November 1892, Douglas Hyde delivered his lecture on ‘The Necessity of De-Anglicising the Irish Nation’ to the National Literary Society in Dublin. This lecture is widely acknowledged as a pivotal moment in the language-based, cultural movement associated with home rule and separatism. The Gaelic league was founded in 1893 and a branch was establish in Belfast in 1896, directly as a result of Hyde’s visit to the BNFC. This has been interpreted as an equally pivotal moment in the separation of racial and cultural determinisms of nationality. The key text is Greta Jones’s “Contested Territories,” published in 1998. Jones quoted a piece written by Haddon in 1890, in which he described much of Folklore ‘as Psychological Palaeontology’. In 2017, Diamuid Ó Giolláin, in his introduction to the English-language edition of Irish Ethnologies quoted jones’ description of Haddon to illustrate significant differences between Haddon and Hyde and, by extension, between the practice of Victorian ethnology in Ireland and the cultural programme of Irish nationalists. The problem here is that Jones misinterpreted Haddon’s original statement and the context in which it was made. In 1890, Havelock Ellis asked Haddon to write a general study of anthropology. Ellis wanted to include it in the Contemporary Science Series, of which he was the editor. Haddon drafted a letter to Ellis and included a list of potential treatments. Haddon’s reference to “psychological palaeontology” is a reductionist representation of a theory of folklore, which attempted to situate the study of folklore within a scientific construction of anthropology. Ellis was using the Contemporary Science Series to publish anarchist texts. He wanted to anchor the series in a general study of anthropology. Patrick Geddes recommended Haddon for the job. Geddes met Haddon in Cambridge in the late 1870s. In 1890, he advised Haddon to become an anthropologist but warned him that the skull measuring business had been overtaken by a great scientific movement that was developing in France around radical approaches to comparative sociology. Geddes introduced Haddon to the writings of anarchist and geographer Pyotr (Peter) Kropotkin and radical ethnologist Élie Reclus. He also introduced him to Ellis. Haddon had become part of a European network of anarchists, socialist, feminists, and social reformers. Top L-R: Élisée Reclus, Louise Michel, Pyotr Kropotkin, Élie Reclus, Noémi Reclus. Bottom L-R: Alice Gomme, G. L. Gomme, Patrick Geddes, Havelock Ellis, The Field Club Union. The photograph of the members of the Field Club Union is used to represent the network of folklore collectors that Haddon put together in Ireland, especially the women – key members of the network – for whom it was not possible to locate portraits online. The fact that Haddon was associating with former communards and anarchists –men and women, whose characters were, according to Geddes, ‘disciplined by the disasters of 70-71’ – may seem a little far-fetched. Haddon and Geddes refer to Kropotkin and Élie Reclus in their correspondence. Furthermore, Haddon and Élisée Reclus participated in the Summer Meeting of Art and Science that was organised by Geddes in August 1895. Reclus gave a number of public lectures on Anarchy on his way to Edinburgh, in which he noted that there was plenty of scope for anarchy in the UK. These people – stateless anarchists and revolutionaries – were very much part of Haddon network in the early 1890s. Members of the combined field clubs of Ireland gathered on the pier in Kimurvey Bay in the Aran islands in 1895. The photograph was taken by Robert j. Welch. It has been cropped here to emphasise the presence of a group of female naturalists. Haddon built his own network in Ireland, drawing heavily of the folklore and field club movements, seen here gathered on the pier in Kilmurvey Bay in the Aran Islands in 1895. He recruited Clara Patterson in January 1893. Patterson trained as a zoologist with Haddon and won a bronze medal in examinations conducted by Haddon under the auspices of the Society for the Extension of University Teaching. The extension of university teaching was promoted by Geddes, Ellis, and Elisée Reclus as a means of empowering socially and politically marginalised groups. Gender equality was a priority area for political action and Haddon’s promotion of women is a matter of record. In this context, it should be noted that Clara Patterson was not allowed to present her research on folklore to members of the BNFC. It was read by Francis Joseph Bigger, which was, as Guy Beiner noted, the practice in organisations like that. Haddon challenged such discrimination in 1890, when he arranged for Alice Shackleton to be the first woman to read a scientific paper to the Royal Dublin Society. In March 1892, The Belfast News-Letter reported that Patterson presented specimens at a meeting of the Microscopical Meeting of the BNFC, which was “designed to be an elaborate illustration of the course of lectures on zoology delivered in Belfast by Professor H. [sic] C. Haddon, M. A. under the auspices of the society for the Extension of University Teaching.” In May, the News-Letter reported that Patterson was awarded a Bronze medal in examinations conducted by Haddon for the Society . in 1894, Haddon wrote about children’s games in his column in the The Irish Daily Independent. He proposed that singing games could represent the last vestiges of savage customs in contemporary society. This may be interpreted as evidence of Haddon’s attachment to what Tabitha Cadbury called the discredited doctrine of “survivals.” That would not be entirely accurate. Haddon may have been using the rhetoric of “survivals,” but his intention was far more radical. Haddon developed the concept of “sympathetic knowledge” and illustrated it by pointing out correspondences between the daily actions of people at the extremes of human kind. This shows how quickly he had incorporated Kropotkin’s ideas into his treatment of anthropological problems. An intimate and friendly acquaintance with savages breaks down many prejudices, and while it often reveals modes of thought and traits of character which are all but incomprehensible to us with our specialized Aryan civilization, yet human nature is displayed at every turn, and common impulses and sympathies link the extremes of human kind. In 1891 Haddon incorporated these ideas into a radical critique of Imperial policy. It was rejected by the editors of a number of ‘monthlies’ before it was suppressed by Huxley in January 1892, on the basis that it would not be acceptable to the Government. Nevertheless, Haddon presented his case at a packed meeting of the Anthropological Secton of the British Association in 1895. He delivered a speech on the subject of interference with the civilisations of other races. It was widely interpreted as an attack on the Empire and its missionaries. Haddon had attacked both church and state and, in the process, he had confronted the political culture of organised anthropology, especially institutional ambivalence to the extermination of other civilisations. These hardly consitute the actions of someone engaged in cultural zoology. Haddon returned to the field in 1898, when he organised the Cambridge Anthropological Expedition to the Torres Strait. He filmed a one minute sequence of the dance of the Malu Zogo Te, the islander who led an initiation ceremony on the Island of Kiam. It was the earliest known use of film as an ethnographic medium. Haddon used a phonograph to record the islanders. A photograph of the recording session was reproduced in Head-hunters, Black, White and Brown, a narrative account of his fieldwork in Oceania that Haddon published in 1901. The photograph shows Ulai singing and Gasu on drums, while Myers acts as recording engineer. This recording does not seem to have survived, but other recording made on the day can be streamed on the British Library website. Stills grabbed from Haddon’s film are strikingly similar to the photographs taken by Patterson in Ballymiscaw in 1893, providing a visually striking illustration of the “fact” that Clara Patterson and Haddon were involved in a joint folklore project that incorporated anarchist ideas and constituted a form of anti-racism activism. If we regard folklore as the practical wing of ethnology – as practiced by Haddon – then we really need to rethink our attitude to (1) his ethnological fieldwork in Ireland and (2) his engagements with cultural nationalists like Douglas Hyde. Haddon was an internationalist, whose politics were shaped by (1) a philosophical understanding of the essential unity of the human species and (2) his experience of the devastating effect of colonialism in Ireland and the Torres Strait. Haddon used photography to materialise ‘the common impulses and sympathies [that] link the extremes of human kind.’ He used the experience of that material to persuade his folklore collectors to look beyond the local and embrace the essential unity of human kind. Whereas Hyde sought to define nationality through the particularity of folklore, Haddon sought to use the universality of folk traditions to confront ethnocentricity at home and its consequences for other civilisations overseas. This was one half of Haddon’s most radical innovation. The other half was the application of revolutionary audio-visual technologies to the task of making the those civilisations meaningful at home. Beiner, Guy, 2012, Revisiting F. J. Bigger: A “Fin-de-Siècle” Flourish of Antiquarian-Folklore Scholarship in Ulster. Béaloideas, 80, 142-162. Cunningham, D. J., and A. C. Haddon, 1892, The Anthropometric Laboratory of Ireland. The Journal of the Anthropological Institute of Great Britain and Ireland, vol. 21, 1892, pp. 35–39. 1891, Annual Address to the Folk-Lore Society, November 26th, 1890. Folk-Lore 2 (1),1-30.Folklore 108 (1997): pp. 120-3. 1890, Incidents in the life of a Torres Straits islander, Lippincott’s Monthly Magazine: A Popular Journal of General Literature, Science, and Politics. Vol XLV. (January to June, 1890). pp 567-572. 1891, A critique of the Imperial Institute (On the Need for a Bureau of Ethnology). (MSS, HP, CUL Folder 5061). 1901, Head-hunters; black, white, and brown. London: Methuen. Hyde, Douglas, 1904, The necessity for de-Anglicising Ireland IN 1904 he Revival of Irish Literature: Addresses by Sir Charles Gavan Duffy, KCMG, Dr. George Sigerson, and Dr Douglas Hyde (London: T. Fisher Unwin, 1904), 117-161. Jones, Greta, 1998, Contested Territories: Alfred Cort Haddon, Progressive Evolutionism and Ireland, History of European Ideas 24 (3): 195-211. Kropotkin, Peter, 1885, What Geography Ought to Be, The Nineteenth Century, Vol. 18, pp. 940-56. O’Giolláin, Diarmuid, (ed. ), 2017, Irish Ethnologies, Indiana 46556: University of Notre Dame Press. This entry was posted in Anthropology, Photography, Politics, Research and tagged Anarchy in the UK, Brexit, Ciarán Walsh, Folklore Society, Haddon the `headhunter', Home Rule, Ireland, Irish Research Council, Maynooth University, Trinity College Dublin. on April 10, 2019 by ciaranwalshnoe. Pietro Longhi, 1757, “True portrait of the Giant Cornelio Magrat the Irishman; he came to Venice in the year 1757; born 1st January 1737, he is 7 feet tall and weighs 420 pounds. Painted on commission from the Noble Gentleman Giovanni Grimani dei Servi, Patrician of Venice.” Museo di Rezzonico, Venice. Photograph: Osvaldo Böhm. Cornelius Magrath was born 5 miles from Silvermines in County Tipperary, Ireland, in 1737. During his adolescence, he developed a rare disorder of the pituitary gland that caused some of his bones to grow excessively. Between the ages of 15 and 16 Magrath went from 5 feet to 6 feet 8.75 inches in height. He was later described in the London Magazine for August 1752 as being of gigantic stature, but boyish and clumsily made. His extraordinary appearance attracted a lot of attention and he was persuaded to exhibit himself. He was put on show in Bristol and London in 1753, before touring extensively in Europe. In 1857 he was in Italy, where his portrait was painted by Longhi (see above). In 1760 he became ill in Flanders and returned to Dublin where he died on May 16th. He was 23 tears of age. In 7 years Magrath had achieved considerable fame as the ‘Irish Giant’ and his death and dissection quickly became the stuff of legend. In 1833, a report claimed that he died as a result of an injury he sustained while performing as a giant in the Theatre Royal. Numerous other legends grew up around the ‘capture’ of his body by anatomists in Dublin University, Trinity College (TCD). A promotional print engraved by Maag in Germany in 1756 to promote appearances by Magrath. This image has been produced from the negative of a photograph made by Daniel J. Cunningham in 1891. Courtesy of the Board of Trinity College Dublin. In 1890, Daniel J. Cunningham’s set out to establish the truth about Magrath’s stature and dispel some of the myth’s about his short life. Cunningham presented a report to the Royal Irish Academy in 1891, which remains the definitive account of the man and his skeleton. Cunningham confirmed that Magrath suffered from acromegaly and presented evidence that he was “positively deformed” as a result of this condition. He was not the “well-built, proportioned, straight-limbed man” with pleasing and regular features as represented by Maag in 1756 (above). Swanzy built on Cunningham’s research and published a report in 1893 that confirmed significant deformation of Magrath’s eye sockets. This is recorded by in Longhi in his 1757 portrait, along with the disabling condition of “knock-knee” that was described by Cunningham. In 1902, huge crowds attended a lecture on his skeleton that was given by Cunningham in Belfast. Curiosity in Magrath remains just as strong today judging by the current controversy over the retention by TCD of his skeleton. The controversy kicked off on the History Show on RTE Radio 1 and was picked up by chat show host Joe Duffy who argued that TCD should bury the skeleton of Cornelius Magrath because it had been ‘body snatched’ and his skeleton put on public display without his consent. The Skeleton of Cornelius Magrath is no longer on public display but is still held by the School of Anatomy in TCD. It is the most famous item in a historic collection of anatomy specimens, records, and instruments that is held in the ‘Old’ Anatomy Building. The building was decommissioned in 2014 and the collection is being resolved as part of post-grad research programme managed jointly by the School of Medicine TCD, Maynooth University, Kimmage Development Studies Centre, and the Irish Research Council. Ciarán Walsh reconstructing the skull measuring device developed by Daniel J. Cunningham in the 1890s. The “Dublin Craniometer” is one of a number of anthropometrical instruments that were discovered when the ‘Old’ Anatomy building in Trinity College Dublin was being decommissioned in 2014. The skull, incidentally, is a plastic model. Photo: Ciarán Walsh. I am employed as a full-time researcher on the project and resolving ethical issues relating to the retention of human remains is a major part of the work in hand. Indeed, the research proposal had to pass rigorous ethical approval procedures in Maynooth University, the School of Medicine TCD, and the IRC before I could get access to the ‘old’ Anatomy building and the collections held therein, which include the skeleton of Cornelius Magrath. To bury or not to bury, that is the debate. The Magrath “case” is interesting because there is no evidence that the body snatching story, however entertaining, is true. The only contemporary account of his death states simply that “Upon death, his body was carried to the Dissecting House,” but that account was probably written by either Robert Robinson, Professor of Anatomy in TCD, or Dr. George Cleghorn, the University anatomist (see Cunningham’s 1891 report to the Royal Irish Academy). What we can say with some certainty is that Magrath died of a wasting disease (phthisis) and it is clear from the Robinson/Cleghorn account that he was receiving medical attention at the time of his death. It records that Magrath’s “complexion was miserably pale and sallow; his pulses very quick at times for a man of his extraordinary height; and his legs were swollen.” Elsewhere, it states that his pulse beat almost sixty times a minutes “on his arrival here.” It sounds like Magrath was being cared for in the School of Medicine TCD when he died. The body snatching legend, best described by Hooper, has it that Magrath was being waked when medical students, egged on by Robinson, spiked the porter and made off with his body, which was immediately dissected in secret. Such a sensational body snatching could not have escaped notice and, furthermore, the dissection was both public knowledge and uncontroversial. Historians of anatomy in TCD have always believed that the body was paid for by Cleghorn and that the acquisition of the body was legitimate and ethical by the standards of the day. The problem here is that there is no documentary evidence of Magrath having consented to dissection or the permanent display of his skeleton. The Anthropological Laboratory in TCD in 1891, from a cyanotype or blueprint of a photograph taken by Charles R. Browne. The laboratory ceased operations in 1903 and its collections were reorganised in 1948. Courtesy of the Board of Trinity College Dublin. That brings us to the contemporary issue of retention or burial. The report of the Working Group on Human Remains in Museum Collections (WGHR), published in 2003, set out public policy in relation to British Museums. The authors of the report acknowledged that human remains in collections “represent a unique and irreplaceable resource for the legitimate pursuance of scientific and other research” (p. 28) but concluded that collections of human remains in museums should be subject to the sort of regulatory frameworks being developed for health authorities and hospitals in Britain (p. 81). One of its principal finding was the need to remove legislative barriers to repatriation or burial by British museums, effectively making the ethical disposal of human remains in museum collections its default position (p. 20, para. 58). In 2004 the introduction of the Human Tissue Act allowed nine national museums to return human remains under 1,000 years old, where they consider it appropriate to do so. The British Museum rejected an application for repatriation in 2012 on grounds other than those provided for in the legislation, which illustrates the complexity of the issues involved and the need to consider claims for repatriation or burial on a case by case basis. In terms of regulation in Ireland, the Human Tissue Bill has been stalled since 2013 and the Inspector of Anatomy, appointed by the Medical Council in the interim, has oversight of the ‘Old’ Anatomy collections in TCD. This leaves the burial of Magrath’s remains at the discretion of the college authorities; which means that any decision will have to deal with public perception as to the “morality” of retaining identifiable human remains in collections of scientific material. That is deeply problematic, and Duffy’s attempt to frame the issue in body snatching folklore is distorting what should be a valuable and timely debate. This entry was posted in Anatomy, Anthropology, Current Affairs, Research and tagged Anatomy, Anthropology, CiaranWalsh, Cornelius Magrath, IRC, Joe Duffy, Kimmage DSC, Maynooth University, Skeleton, TCD, www.curator.ie on March 6, 2017 by ciaranwalshnoe. The Aran Islands … the most remarkable islands I have come across anywhere. Alfred Cort Haddon 24th July 1890. Michael Faherty, The Aran Islands. With permission of the Board of Trinity College Dublin. Alfred Cort Haddon, 24th July 1890. The word “many” is a guess. In the original manuscript there is a blot, where the ink spilled out of Haddon’s pen (who remembers fountain pen and ink blots?). He appears to have been ina rush to record his first impressions of the Aran Islands. Haddon landed in Inishmore – the “big” island – for the first time at 8.30 in the morning on Thursday 24 July, 125 years ago today. Galway as photographed by American folklorist and travel writer Clifton Johnson, reproduced from ‘The Isle of the Shamrock’ published in 1901. I can’t tell you all the excursions we made in Aran it wd be as tedious for you to read as for me to write suffice it to say that Dixon & I left very little unseen & what with sketches & photographs we have a good deal on paper. I have seen many groups which could make lovely photographs if they could be taken instantaneously & unknown to the subjects. The old women here affect a close fitting white muslin cap. In the village of Killeany – close by where Mrs. Green’s house is – I endeavoured to make friends with the people by employing my old tactics of noticing the children – but I had not much time to follow it up. I hoped to take photographs of them later on. The day before we left we took our cameras but with the exception of a few men & lads none would stay to be photographed. When we turned a camera on a group the components scattered as if we were firing upon them, girls & woman fled to their houses whipped up the children & barred their doors. As we could not understand Irish we had to guess the nature of their remarks. At last matters got to such a pitch the we both rapidly retreated in different directions. This anecdote is interesting for a number of reasons. First of all, it does not feature in Quiggin’s biography, which relies heavily on similar anecdotes from the ‘Fingal’ journal in order to establish the character of Haddon and describe the time he spent in the west of Ireland. Haddon’s account of stealing skulls from Inisbofin features as does an account of the wife of the Lord Lieutenant – the Queen’s representative and effective ruler of Ireland – drinking poteen (illegally distilled alcohol) in Connemara. This suggests that Quiggin did not have access to this part of Haddon’s journal when she was writing his biography in 1942. I think that these pages became separated from the original manuscript sometime in 1892, when Haddon was preparing a paper on the craniology of the Aran Islands. This was read into the proceedings of the Royal Irish Academy on 12 December 1892. They were rediscovered in 2013 by Aidan Baker, the Haddon Librarian in Cambridge University, when he presented the Irish ‘Headhunter’ exhibition in the Haddon Library. The exhibition comprised photographs from the albums of Charles R. Browne. Browne worked with Haddon on the Irish Ethnographic Survey. He assembled the photographic archive of the survey in a series of six albums in or around the year 1897. One section of the Ethnographic Survey of Ireland’s representation of The Aran Islands. 2 pages from the photograph albums of Charles R. Browne. With permission of the Board of Trinity College Dublin. On the occasion of the opening Aidan and I thought it would be a nice gesture to read from Haddon’s copy of the seminal Ethnography of the Aran Islands published by Haddon and Browne in 1893. There wasn’t a copy in the library but a search of “the locked room” turned up an envelope containing Haddon’s own copy of Studies in Irish Craniology: The Aran Islands by Professor A. C. Haddon. 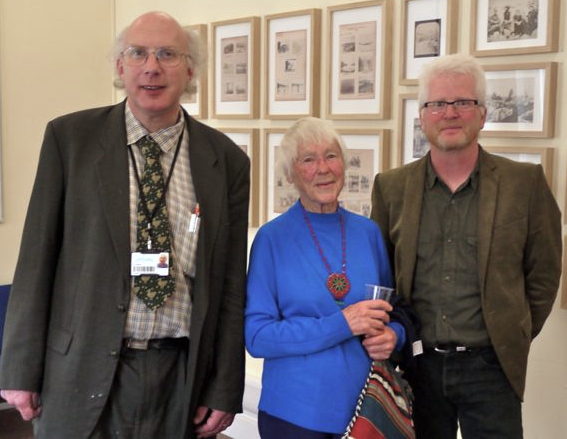 Aidan Baker, Haddon Librarian, Margaret Risbeth, granddaughter of Alfred Cort Haddon, and Ciarán Walsh, http://www.curator.ie, at the opening of the Irish ‘Headhunter’ in Cambridge in 2013. With permission of the Board of Trinity College Dublin. Our illustrations, which are from photographs taken by Mr. A. F. Dixon of Dublin, illustrate (1) a class from national school held in the open air, (2) a group of two men and a boy on the top of the ancient stone fort at Inishmaan [Inis Meáin] the men are wearing pompooties and the boy the characteristic petticoat which the small boys wear as well as girls. The illustrations continue with a series of antiquities, the whole show roughly corresponding to the sequence of photographs collected by Browne in the album dealing with the Aran Islands. It is an extraordinary document. It is no exaggeration, I believe, to claim that this is the moment that Haddon first conceived of “scientific” or modern visual ethnography which was central to his conception of fieldwork as defined during the Cambridge Expedition to the Torres Strait in 1898 – where the young photographer Anthony Wilkin slotted into Dixon’s role. It becomes clear that writing and sketching were not up to the task of conveying the impression that the Aran Islands and their inhabitants made on Haddon. He wrote in his journal (p. 42) that “When I return to Dublin I hope to have some photographs to show you which will illustrate the physical features better than I can describe them.” Haddon quickly converted Dixon’s photographs into lantern slides and the illustrated lectures that followed made the Aran Islands visible as never before. Haddon’s reach extended far beyond his network of contacts in the RDS, the Royal society of Antiquaries of Ireland and the Royal Irish Academy however. He was strapped for cash and undertook a lot of public speaking engagements. Most of these were illustrated with lantern slides, meeting the demand for magic lantern shows and satisfying public curiosity about life in the ‘primitive districts’ of the west of Ireland. All of this activity was taking place at a key point in the consolidation of the Gaelic revival as a movement. It is possible that Haddon’s magic lantern shows represent a visual turn in what had been a largely language based cultural movement. Most people think of Synge in this respect but Synge’s photography dates from 1898, 8 years after Haddon visited Aran for the first time. At that time Synge would have been reading for his “Little Go” or final freshman examinations in TCD – “poor Johnnie got a third” his mother lamented. Synge can be ruled out at this stage. The key figure in this context – the increasing ‘visibility’ of the west of Ireland as a component of a visual turn in cultural nationalism – is a remarkable woman and photographer called Jane W. Shackleton. Her career as a photographer had been completely overlooked in the history of photography in Ireland until Christiaan Corlett published a collection of her photographs in 2012. Jane W. Shackleton followed Haddon to Aran in 1891 and, in total, visited the islands on 12 occasions, four of those as part of field trips organised by the Royal Society of Antiquaries. She visited Inishmore/ Inis Mór for the last time in 1906. Shackleton had developed an interest in photography in the 1880s as the industrialisation of the medium brought it within the reach of middle class ‘amateurs.’ Between 1885 and 1906 – mainly – she amassed one of the largest collections of early photographs by a female photographer in Ireland (the collection is intact and curated by the Shackleton family). Regardless of gender, Shackleton was one of the most prolific photographers at a crucial point in the imagination and representation of the Irish nation. The people of the west of Ireland – the Aran Islands in particular – featured prominently in Shackleton’s photographs and the many illustrated lectures that she gave as a member of the Royal Society of Antiquaries. Apart from having a strong social documentary feel to it, Shackleton’s photography had to have had an influence on the Gaelic revival and must have contributed to the visual turn stimulated by Haddon in 1890. This is speculative at this stage but my research into this has only just begun. ‘Mode of carrying curragh’ from the photograph albums of Charles R. Browne. With permission of the Board of Trinity College Dublin. One photograph is of particular interest. It shows two men carrying a currach, an image that functions as an instantly recognisable trope of the islands. Corlett reproduces it on page 149 as Curragh being Carried by Aran Men Inis Mór, County Galway C. 1899. The same image is to be found among the first generation of prints and lantern slides in the Haddon collection and, the photograph albums of Charles R. Browne (see above). The provenance of the photograph has to be determined – how it came to be in the Haddon collection. Haddon was an avid collector and built his collection from a wide range of sources. That points to the mobility of photographic images at this time, demonstrating that photographs and lantern slides were highly mobile meaning making technologies – to paraphrase Donna Haraway. Jane W. Shackleton died in 1909, the same year as John Millington Synge. Synge had taken about 50 photographs in the west of Ireland but these quickly became detached from his narrative of life in the Aran Islands – they were replaced by illustrations by Jack B. Yeats. Around 30 of those photographs were collected and published by Lilo Stevens in 1971 but the full impact of Synge’s photography was not realised until I exhibited them in association with the Library in TCD in 2009, marking the centenary of his death. The big question is why Shackleton’s career as a photographer and, in particular, her role in making the west of Ireland visible has been so overshadowed by Synge – whose own photography was neglected so thoroughly for almost a century. Add Dixon’s photography to the equation and the exception begins to look like a pattern. The Ethnography of the Aran Islands and the other surveys carried out by the Irish Ethnographic Survey have been regarded for too long as a narrow, racially inflected colonial enterprise. Dublin was, and is, a small place and the extent to which Haddon, Dixon, Shackleton and Synge were all part of the same class that engaged with the idea of Irishness at the end of the 19th century is all too often overlooked. And that, as they say is another story. Corlett, Chris, 2012, Jane W. Shackleton’s Ireland, Cork: Collins Press. De Mórdha, Dáithí and Ciarán Walsh, 2012, The Irish Headhunter, The Photograph Albums of Charles R. Browne. Dublin: Stationery Office & http://www.curator.ie. Green, David H and Edward M. Stephens, 1959, J. M. Synge 1871-1909, New York: MacMillan. Herle, Anita and Sandra Rouse (eds. ), 2009, Cambridge and the Torres Strait, Cambridge: Cambridge University Press. Johnston, Clifton, 1901, The Isle of the Shamrock, New York, London: The MacMillan Company. Quiggins, A. Hingston, 1942/2010, Haddon the Head Hunter, Cambridge: Cambridge University Press. Stephens, Lilo, 1971, My Wallet of Photographs, Dublin: Dolmen Editions. Walsh, C., 2013, Charles R. Browne, The Irish Headhunter, Irish Journal of Anthropology Vol 16. Anthropological Association of Ireland. Walsh, C., 2012, John Millington Synge, Grianghrafadóir in: De Mórdha, M. (Ed.). Ceiliúradh an Bhlascaoid 14. Dublin: Coiscéim. This entry was posted in Anthropology, Heritage, Photography and tagged A. F. Dixon, Aidan Baker, Alfred Cort Haddon, Alison Hingston Quiggin, Anthropology, Aran Islands, Ballymaclinton, Cambridge Expedition Torres Strait 1898, Cambridge University, Charles R. Browne, Christiaan Corlett, Ciarán Walsh, Citie of Tribes, Connemara, currach races, Donna Haraway, Galway, Haddon Librarian, Haddon The Head Hunter, Irish 'Headhunter' exhibition, Irish Ethnographic Survey, Jane W. Shackleton, John Millington Synge, Lilo Stevens, magic lantern shows, Maynooth University, My Wallet of Photographs, pompooties, poteen, rasáí na gcurrach, Royal Dublin Society RDS, Royal Irish Academy, Royal society of Antiquaries of Ireland, Situated Knowlewledges, Studies in Irish Craniology: The Aran Islands, TCD, Trinity College Dublin., www.curator.ie on July 24, 2015 by ciaranwalshnoe. What happened on Inishbofin in July 1890? Three days that changed the history of Anthropology in Ireland and Britain. 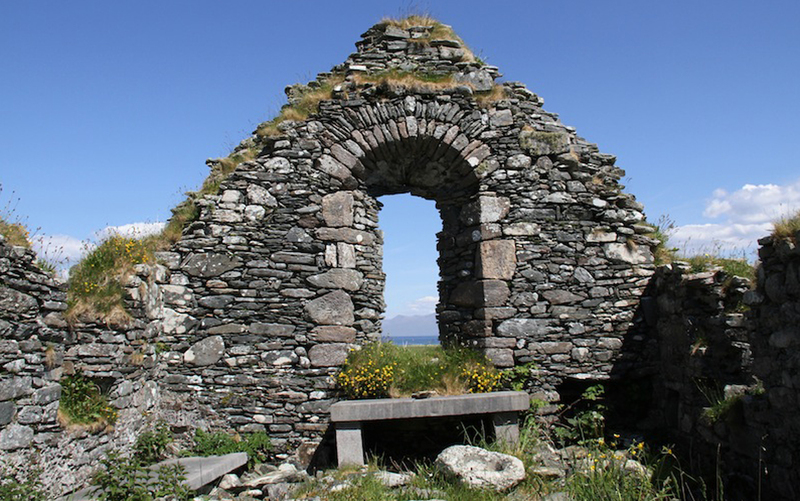 St. Colman’s Abbey is a small ruin on a remote island off the West coast of Ireland. It is situated on the site of a seventh century monastery established by Colman of Lisdisfarne around 668AD. Archaeologically speaking this is a modest site but it is the setting for a remarkable sequence of events that were to have profound consequences for the development of anthropology in Ireland and the United Kingdom. On Wednesday 16 July 1890 – 125 years ago to the day – the steamer Fingal anchored in Inishbofin. The Fingal had been chartered by the Royal Dublin Society (RDS) for survey work on the fisheries of the western seaboard. One of the scientists on board was Alfred Cort Haddon, a marine zoologist who had developed an interest in ethnology—the comparative study of races—whilst on a similar survey the year before in the Torres Strait,located between Australia and Papua New Guinea. Haddon had joined the remarkable and Reverend William Spottiswood Green, Inspector of Fisheries, in Killybegs in County Donegal on 26 June and headed south three days later. Haddon assumed responsibility for keeping a “narrative ” journal of the survey. Green’s narrative has been publish by the RDS but Haddon’s account has never been published in full and the manuscript is held in Cambridge University. Wednesday – July 16 . Dixon and I got up at 6 o’clock & photographed Cromwell’s Fort and had a bathe. The 2 Mrs Allies (who reside on the island) & Father McHugh came to breakfast at 8 o’clock & after breakfast we tried a new fishing ground for longline fishing. We had just over 400 hooks out on a line measuring about —- feet – the result was poor for we only got 1 Halibut / 5 foot long and weighing 95lbs.) 1 Turbot, 1 Cod, 13 Ling, 17 Conger, 2 Torsk, 1 Cuckoo-Gurnard, 6 Pickard dog fish, 1 Tope, 7 Nurse-Hounds (Dogfish), 1 Skate, 1 Ray. – Then Dixon and I had to measure, weigh & examine a selection of them. I will explain our particular work on another occasion. The 2 Mr Allies are Englishmen – some time ago, 8 or 9 years I believe, their father foreclosed on a mortgage on this island & so it & several others some 7 in all – including rocks – became his property & he sent a son to look after it & he has lived here ever since. For about the last 18 mths. another brother joined this one & so these 2 middle aged men are living bachelor’s lives on this out of the way island – fishing, farming, & so forth. They have both spent several years in Australia, mainly in Queensland, sheep farming etc. The latter brother is more or less () an engineer. The former is the recognised landlord. I got more intimate with Edward, the engineer, & I hope I have interested him in Folklore & he has promised to collect information for the Royl. Irish Academy. He told me of an old ruined church where there were some skulls & we arranged with Dixon a plan of action. We all went ashore together that night & he provided us with a sack & later in the dark, took us close to the church. The coast being clear Dixon & I climbed over the gate & went down the enclosure which is practically a large graveyard, on our way we disturbed several cattle. We stumbled along & entered the church tumbling over the stones which are placed over the graves, in the corner we saw in the dim light the skulls in a recess in the wall. There must have been 40 or more, all broken, most useless but on (overhanding) them we found a dozen which were worth carrying away & only one however had the face bones. Whilst we were thus engaged we heard 2 men slowly walking & talking in the road & like Brer Fox – we ‘lay low’ & like the Tar Baby “kept on saying nothing.” When the coast was clear we put our spoils in the sack & cautiously made our way back to the road, then it did not matter who saw us. We returned to the Allies’ house. Dixon kept the bag & then Poole went off to the gig with us. The 2 sailors wanted to take the bag for Dixon but he wouldn’t let them & when asked what was in it replied “poteen.” So without any further trouble we got our skulls aboard & there we packed them in Dixon’s portmanteau & locked it, no one on the steamer, except our two selves, having any idea that there were 12 human skulls in the steamer & they shan’t know either. Teampall Chomain by Dixon. The niche where the skulls were kept is visible in the lower right hand corner. The sketc h referred to by Haddon below is an exact illustration of this scene, suggesting that the sketch and the photograph are contemporaneous. This copy of the photograph is from the photograph albums of Charles R. Browne. With permission of the Board of Trinity College Dublin. Next afternoon we landed & went to have a look at the place by daylight & then I made this sketch [a drawing illustrating the site of the niche and the skulls]. The whole place is a mass of graves covered with loose stones. There are no inscriptions & there is no carving anywhere. This particular building was the chapel of a monastery which was founded by St. Coleman in about 667. It is referred to by the “Venerable Bide”; but soon passed into oblivion. On the succeeding page I give a sketch of the church from a neighbouring hill, showing Inishlyon in the middle distance and the mountains of Connemara in the far distance, the group of mountains to the right is “The Twelve Pins.” In the right hand neat corner of the churchyard is St. Colman’s will of which the accompanying is a sketch, the well itself is inside. Teampall Cholmain, Inishbofin by Marie Coyne, Inishbofin Heritage Museum. Haddon left Inishbofin on Friday 18 July 1890. In November 1893 he presented a more formal report on Studies in Irish Craniology II, Inishbofin, Co. Galway to the Royal Irish Academy. Cyanotype of the Anthropometry Laboratory and Comparative Anatomy Museum in TCD in 1891. With the permission of the Board of Trinity College Dublin. Haddon had earned the nickname “Haddon the Headhunter” as a boy because of a prank he played on his sisters. The visit to Inishbofin set in train a series of events that converted a boyish fascination with skulls into a scientific orthodoxy that was the signature of an influential player in the establishment of anthropology as a scientific discipline in Britain. Dixon had been working in comparative anatomy under Professor Daniel J. Cunningham of TCD. At the time Cunningham was mapping the topography of the human brain and comparing this to the brains of anthropoid apes. Dixon was also a keen photographer. This meeting of interests was to have a major influence on Haddon’s future direction as a scientist. He became obsessed with craniology – the categorisation of skull types through the measurement of particular features – and developed a theory of racial migration based on tracking the distribution of different skull types. On his return to Dublin Haddon and Cunningham established an Anthropometry Laboratory in TCD and in 1891 they launched the Ethnographic Survey of Ireland. This was an attempt to use laboratory methods “in the field” in an attempt to trace the origins of the Irish race; this was the origin of the term “fieldwork” which, in this case, consisted of measuring and photographing the physical characteristics of people in the remotest districts in Ireland, starting in the Aran islands in 1892. Charles R. Browne “in the field” in Inishbofin in 1893. From the photograph albums of Charles R. Browne. With Permission of the Board of Trinity College Dublin. The following year his colleague Charles R. Browne returned to St. Colman’s Abbey but the islanders prevented him form stealing more skulls. Browne, a medical doctor, was more interested in social conditions in the West and, with Cunningham, began to emphasise sociology over physical anthropology and, ethnography over measurement: a split that anticipated a major philosophical divide in the natural and social sciences in the 20th century. That is a story that has yet to be told. Photography by Marie Coyne, The Inishbofin Heritage Museum. This blog is based on a presentation made by Ciarán Walsh at the Anthropology and Photography Conference organised by the Royal Anthropological Institute of Great Britain and Ireland in the British Museum in May 2014, in association with Dr Jocelyne Dudding (Cambridge) and Dr Mark Maguire (Maynooth). This research continues as a postgraduate research project with the Anthropology Department of Maynooth University in association with the Irish Research Council. 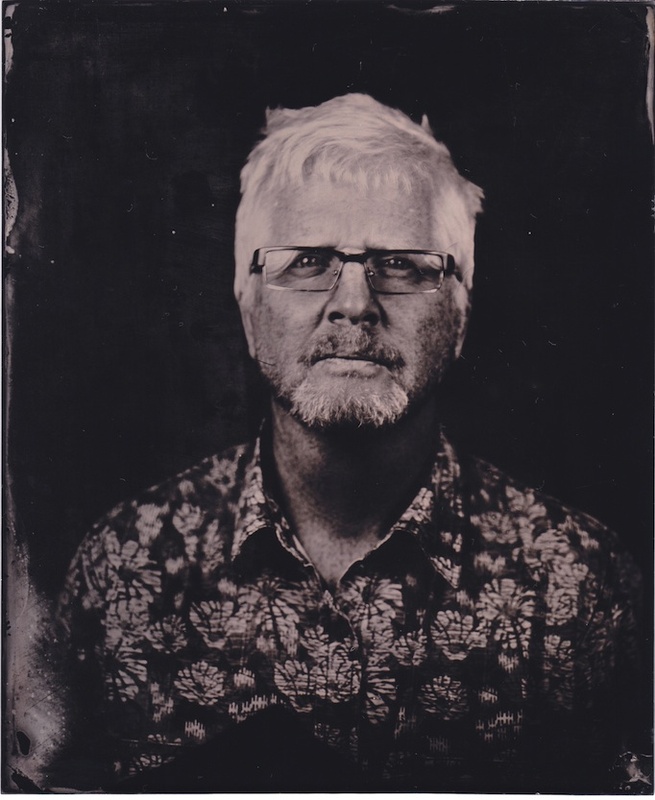 Ciarán Walsh was elected a Fellow of the Royal Anthropological Institute in 2015. The photographic archive of the Irish Ethnographic Survey was published by Ciarán Walsh and Dáithí de Mórdha in 2012 in association with TCD, the OPW and the Heritage Council of Ireland. See De Mórdha, Dáithí and Ciarán Walsh, 2012, The Irish Headhunter, The Photograph Albums of Charles R. Browne. Dublin: Stationery Office & http://www.curator.ie. This material was updated in 2013 in an article by Ciarán Walsh for the Irish Journal of Anthropology: Walsh, C., 2013, Charles R. Browne, The Irish Headhunter, Irish Journal of Anthropology Vol 16. Anthropological Association of Ireland. This entry was posted in Heritage, Photography and tagged Charles R. Browne, Ciarán Walsh, Haddon the `headhunter', Inishbofin, Inishbofin Heritage Museum, Irish Ethnographic Survey, Irish Research Council, Marie Coyne, Maynooth University, Photography, TCD, Trinity College Dublin. on July 18, 2015 by ciaranwalshnoe.